Why Choose the Nursing Program? Our Nursing program prepares students for a rewarding career in a variety of high-demand nursing fields. In this field, there are always jobs, you are always learning, and you are always making a difference in the lives of others. CPTC boasts a training facility that includes the latest technology for giving students hands-on simulated experience with patients. Meanwhile the degree and certificate options provide a wide array of options for students to find the path that best fits them, ranging from a one-quarter Nursing Assistant Certificate to an Associate in Pre-Nursing Degree that prepares graduates for upper-division coursework leading to a Bachelor of Science in Nursing degree at one of the numerous Direct Transfer Agreement baccalaureate institutions. For students who are already working as Licensed Nurse Practitioners and want to progress to the role of a Registered Nurse, the RN Option Degree provides the necessary training. If you have a passion for medicine and helping people, a career in nursing might be a perfect fit for you. We appreciate your interest in the Registered Nursing Program at CPTC. Clover Park is committed to delivering quality education that produces safe & effective nurses for tomorrow’s workforce. To meet this vision, our RN program is being re-imagined and we will not be admitting students at this time. Updated information will be posted to the college website as it becomes available. Graduates of our Nursing Assistant or Nursing Assistant I-BEST earn a certificate and are prepared to take the state certification test (NAC). The NAC provides basic care under the supervision of an LPN or RN. The Practical Nurse application process is being revised. Please check back for updates for applying to the fall quarter. The LPN and RN programs are now in candidacy status for NLN accreditation. The LPN program has full approval with the Washington State Nursing Care Quality Assurance Commission. The RN program has conditional approval with the Washington State Nursing Care Quality Assurance Commission. Advocate for patients and families in ways that promote their self-determination, integrity, and ongoing growth as human beings. Make judgments in practice, substantiated with evidence, that integrate nursing science in the provision of safe, quality care and that promote the health of patients within a family and community context. Implement their role as a nurse in ways that reflect integrity, responsibility, ethical practices, and an evolving identity as a nurse committed to evidence-based practice, caring advocacy, and safe, quality care for diverse patients with a family and community context. Examine the evidence that underlies clinical nursing practice to challenge the status quo, question underlying assumptions, and offer new insights to improve the quality of care for patients, families and communities. The program's three-year mean for licensure exam pass rate will be at or above 80%. A minimum of 80% will report satisfaction with their self-assessment of preparation for entry-level positions. A minimum of 80% of students entering the RN program will complete the program within eighteen months of admission. A minimum of 80% of employers of CPTC graduates will report satisfaction with graduate preparation for entry-level positions. Promote the dignity, integrity, self-determination, and personal growth of diverse patients, their families and oneself to provide individualized, culturally appropriate relationship-centered nursing care. Make judgments in practice, substantiated with evidence, that integrate nursing science in the provision of safe, quality care for diverse patients and their families in collaboration with the health care team. Articulate a unique role as a member of the health care team, committed to evidence-based practice, caring, advocacy, and safe quality care, to provide optimal health care for diverse patients and their families. By collaborating with health care team members, utilize evidence, tradition and patient preferences in predictable patient care situations to promote optimal health status. 100% of graduates will report having obtained employment within six months of graduation. A minimum of 90% of graduates will report satisfaction with their self-assessment of preparation for entry-level positions. A minimum of 75% of students entering the PN program will complete the program within eighteen months of admission. A minimum of 75% of students will pass each nursing course with 80% or higher each quarter. Student will demonstrate basic nursing assistant skills while caring for patients. 100% of students will demonstrate ability to apply theory to practice by passing final written exam with 78%. Students will demonstrate competency while providing basic nursing assistant skills in laboratory setting. Students will complete the following required components for eligibility for state NAC exam, which will include: Theory 58 hours, Lab 40 hours, Clinical 50 hours. 100% of students will pass the “mock state exam” in lab after clinicals. Nursing Program Information Sessions are hosted in Building 21, Room 108, at 3 p.m. on the second and fourth Wednesdays of the month. For more information and a complete schedule of session dates, click here. 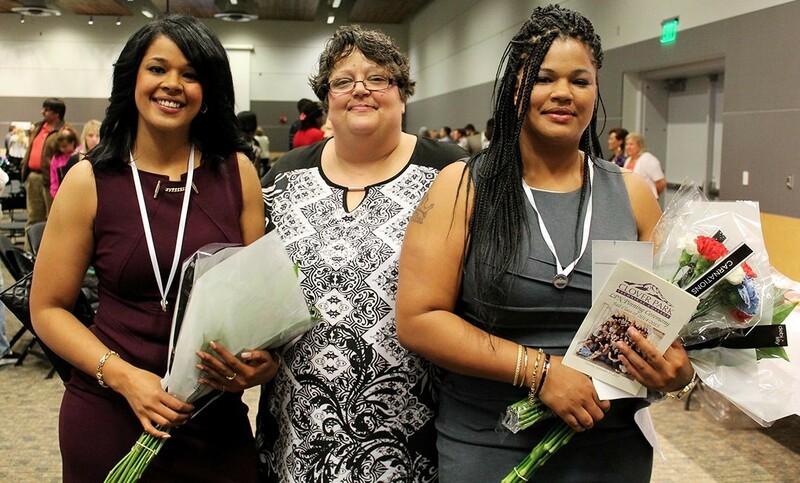 As the 2018 fall quarter came to a close Wednesday, the Clover Park Technical College Nursing program hosted its traditional Licensed Practical Nurse Pinning Ceremony to recognize the 20 students earning their Practical Nursing Certificate. Kristina and Celeste Lott were exposed to the field of nursing at a young age. Their mother, Kristi Lott, received her practical nursing certificate from Clover Park Technical College in 1999. The daughters both eventually became Certified Nursing Assistants.